Have you heard the news? Dew Drop Inn has reopened!! I’ve been following their Facebook page closely and waiting as patiently as possible, but I sure have been craving their wings for the whole month of January (they closed for the month to do some renovations). So when we heard yesterday was the day, my husband and I knew we had to go visit our friends at Dew Drop Inn! 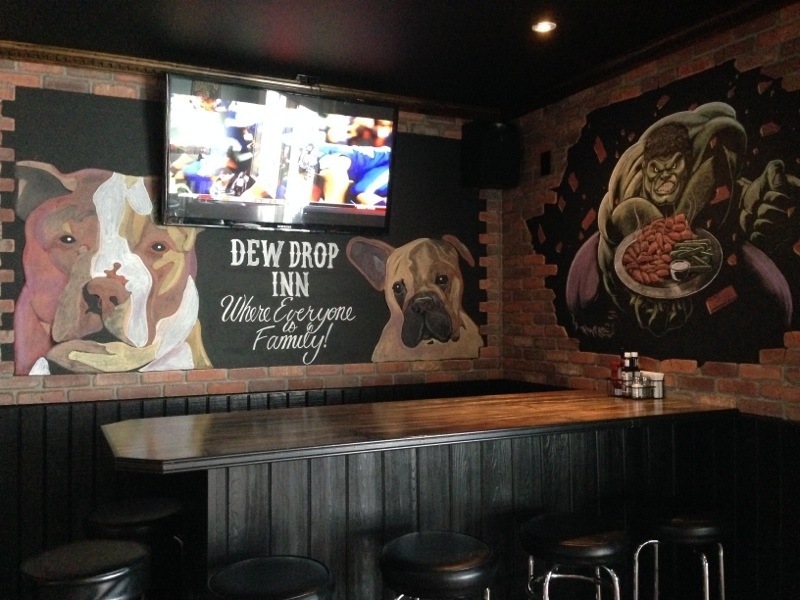 A portrait of Dew Drop’s owners’ two dogs makes its appearance on one wall – aren’t the pups adorable?! The other bit of Dew Drop info I had also heard was that not only were they opening this week, but they also added 60 wing flavors. 60, as in SIXTY, as in 6-0. How long will it take me to try the entire new wing menu – weeks? months? years? Will my favorites still be on the menu (slight panic appeared here briefly)? 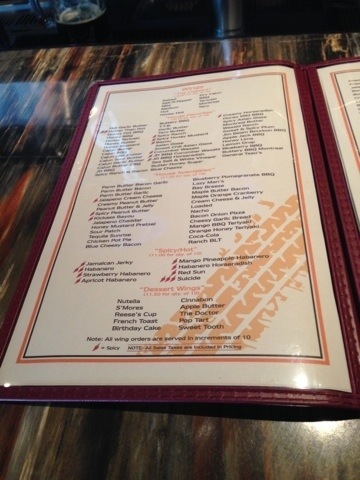 How will I choose what to start the new year and the new menu with? And it’s true, they added 60 flavors! The wing menu is broken down into five categories: The Classics, House Favorites, House Specialties, Spicy/Hot, and Dessert. So for you regular Dew Drop customers expect to see your old favorites (yes, PB&J is still on the menu- read more here), and some new flavors include the three we tried below, and others such as lemon drop, sour patch, honey mustard pretzel, coca-cola, french toast, cinnabon, and nutella. 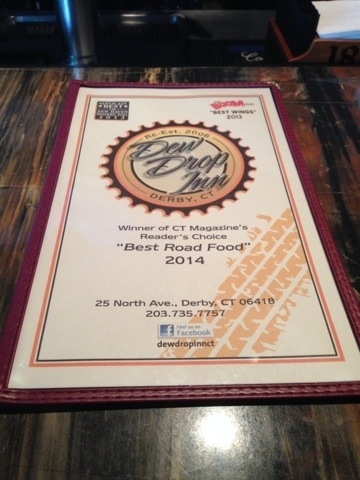 Lucky for me, and for all of us, the staff at Dew Drop are always happy to help make food and drink recommendations. 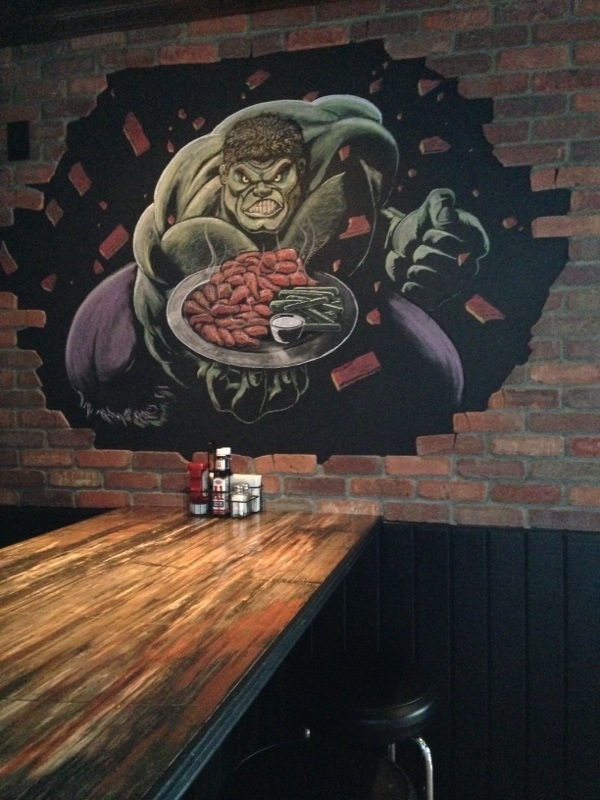 For our first try of the new menu we went entirely on staff recommendations and they never steer us wrong. This page of the menu (below) is JUST wings! 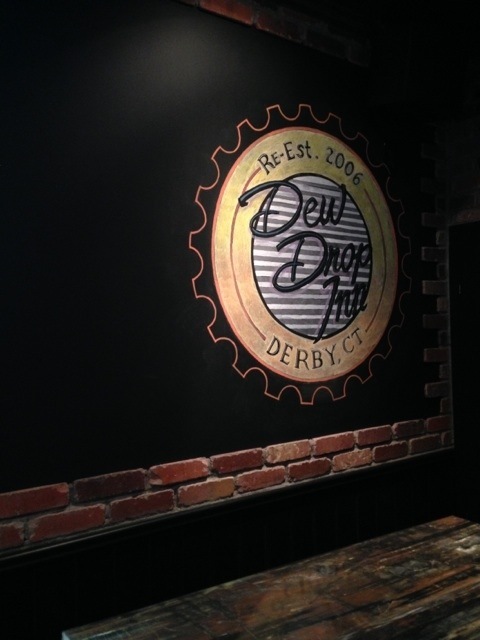 It isn’t just wings that have been added to the menu – Dew Drop has added new burgers, salads, sandwiches, and wraps. The beer menu changes regularly, as it always has, and there are lots of craftbeers available for all the beer lovers. 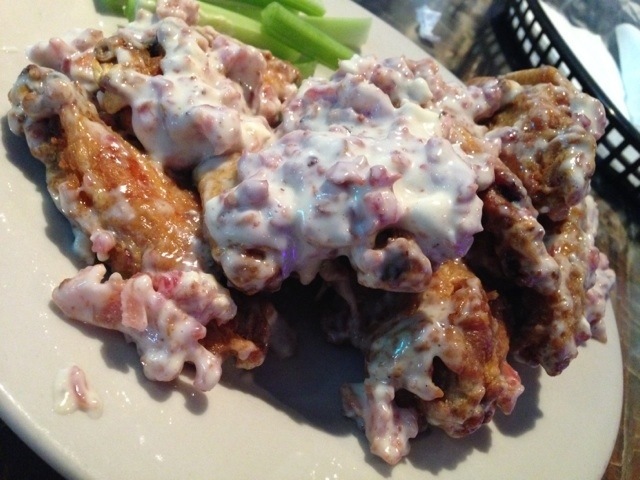 Blue cheese is synonymous with wings. 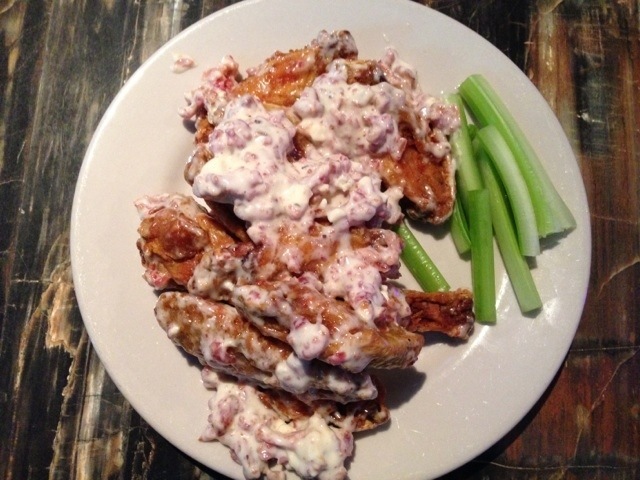 When you order wings at any establishment, you’re most likely to get some blue cheese on the side to dip your wings in. Well, when you order the Blue Cheesy Bacon wings, Dew Drop does it for you. 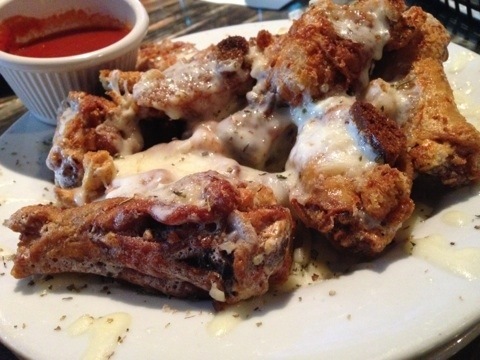 Your wings are slathered with a delicious blue cheese that is tasty, but not too overwhelming in flavor so your taste buds still get to experience the flavor of the chicken wing itself. 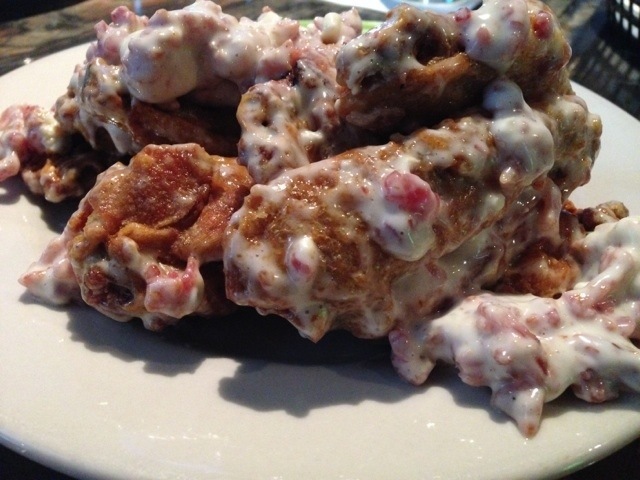 Topped with some crumbled bacon, the Blue Cheesy Bacon wings are a wonderful balance of flavors I love: blue cheese, bacon, and chicken wings. The only problem with this flavor of wings is you won’t want to share the order with anyone else because you won’t be able to stop eating them! Imagine all the flavors and ingredients of a chicken pot pie – corn, carrots, celery made into a hearty mixture, and chicken. 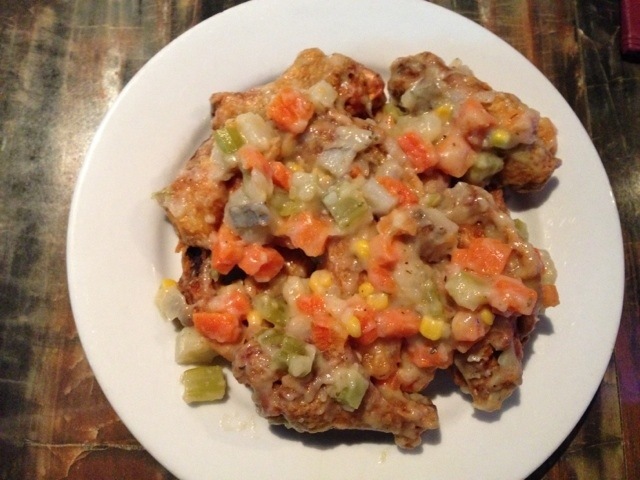 Now imagine some excellent chicken wings tossed and then topped with the filling of a chicken pot pie because that’s what Dew Drop did, and now you can order Chicken Pot Pie Wings! Chicken pot pie is one of those hearty comfort foods most people enjoy, especially this time of year, and the Chicken Pot Pie Wings combine two foods so many people love – chicken wings and chicken pot pie. 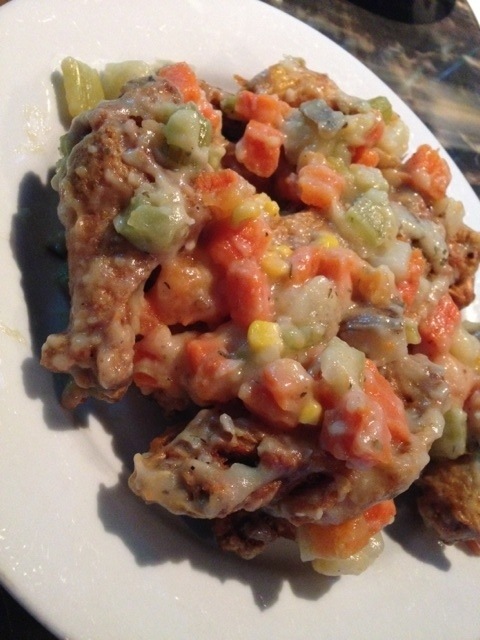 These wings are flavorful and filling, just as you’d expect from a traditional chicken pot pie. Buttery, cheesy, garlicky goodness on top of crusty bread is what comes to mind when someone says the words “garlic bread” to me, one of my favorite things to eat. So when I was told yesterday that Dew Drop added a cheesy garlic bread wing to their menu, I knew I had to try them. 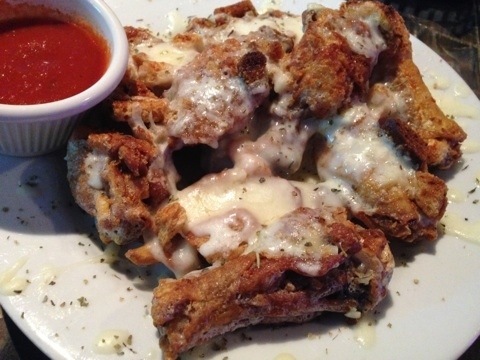 How are the Cheesy Garlic Bread Wings? Um, they’re AH-mazing! They left me speechless. Butter, mozzarella, garlic, bread crumbs and crutons envelope the chicken wings. 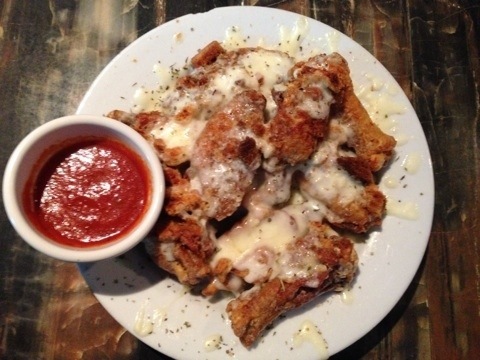 Oh, and don’t forget the marinara to dip them in! It was so great to see our friends at the Dew Drop Inn yesterday, and trying some really creative and delicious new wing flavors made the visit even better! I can’t wait to go back and try more off the wing menu! I have a special place in my heart for TK’s, but Dew Drop is pretty rad too. Can’t wait to try some of the new stuffs.